I have been typing up a more meaty post, but I don’t have it finished, so I thought I would share with you some of the sewing I did in the nesting phase of my pregnancy. A lot of this was done in the week I was past my due date. I don’t know why people are so upset about going past their due dates…they are missing out on an excellent manic-phase which allows a mama to accomplish tons! I am a dedicated babywearer. Right now, I have our little babe tucked happily in a favourite wrap. 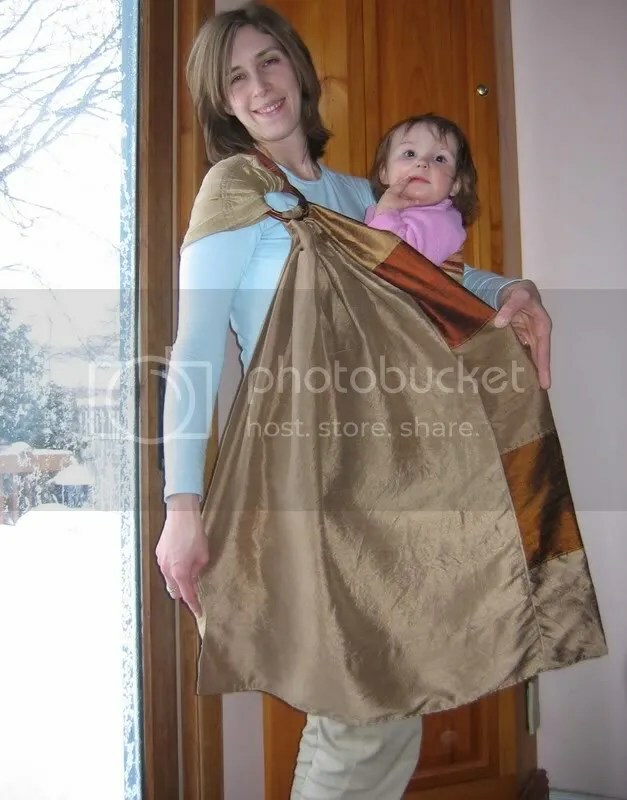 A high-quality German-style woven wrap is my absolute must-have carrier. I use it constantly. 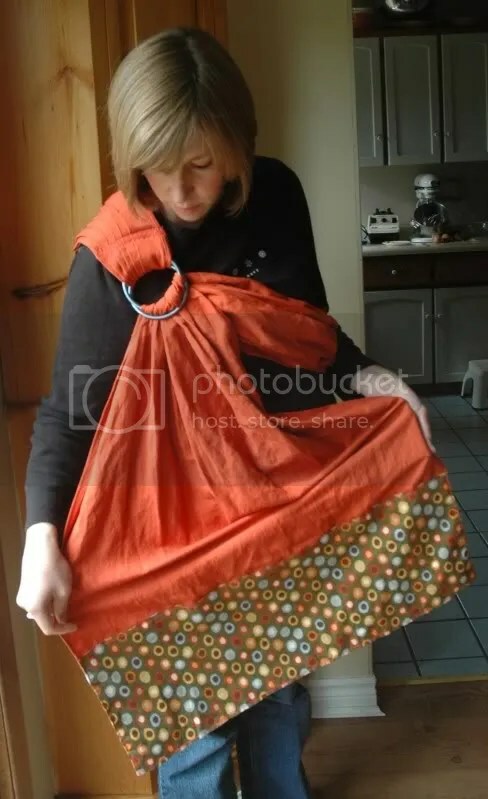 For quick in and outs, though, I am a big fan of the simple ring-sling. In my stash, I only had two slings (gasp! ), which is not particularly adequate for my needs, however, since one is a silk sling, which I mostly wear for dressier times. I like to keep a sling in the van at all times, since accidentally forgetting a baby carrier is torture for me! Speaking of my silk sling, here is an older picture. I made this myself several years ago. My sister, married in July of 2008 allowed me to wear my sleeping 4 month old in it all through her ceremony when I was her Matron-of-Honour. Her sweet flexibility and easy-going nature are two reasons I love her so much. Anyway, onto my latest sling. What I wanted was something sturdy and functional, but with zippy colours, so I would feel dressed up when I was wearing it. I found some beautiful pumpkin-coloured cotton/linen on sale at my local fabric store for $4/yd. I only needed 2.5 yards, so it was a total cost of just over $10. In fact, I actually have enough for two slings because I split the fabric vertically all the way down the middle. I wanted to add an accent, but the cheap fabric places don’t really have anything too exciting, so I headed over to the fabric store where just about every fabric is gorgeous. It is a place I go if I need a fabric treat (or inspiration!). Sadly, I don’t have an eye for colour at all. I knew what I wanted, but I just can’t see what goes together. It can be very frustrating for someone who loves crafts so much to not be able to combine beautiful fabrics on my own. So, I did the smart thing and asked for help. The ladies who work at the quilting store are fantastic. They all have an eye for colours and patterns. Christine, my favourite fabric-lady, was working that day. I showed her my fabric and told her I wanted something to accent a sling, but I just couldn’t see it. I was looking for something that would be: bold to accent the pumpkin fabric and a geometric-type pattern — not flowers, but maybe implied flowers. She immediately took me to a shelf and pulled a bolt off the shelf, “What about this?” Gasp!! She is a genius. I squealed. (Sad, but true.) She definitely sees it. I bought a half-yard. I have been enjoying it a lot and using it plenty. It is such a sweet blessing to be able to cuddle a sleeping baby and still meet the needs of my other family members. I wish they were little just a little longer. We have a new baby!! It was a beautiful, warm, sunny day with gorgeous fall colours. At the Farmer’s Market, we bid goodbye to our favourite fruit vendor who was at the market for her last day before next summer. I will miss her! We picked up our week’s food and, as always, ran into several people we know, which is one of the best things about the local Farmer’s Market. We ran a couple of errands, including taking our daughter to Build-a-Bear to choose a new outfit for her bear, courtesy of the other kids in our family and finished up with a delicious lunch. While doing our usual stops that morning, we even ran into the midwife who attended her birth exactly 9 years prior,which was very special. At 1pm, I met my midwife at her office for a stretch and sweep, which to this point I had been fairly resistent to having. I was exactly 41 weeks. 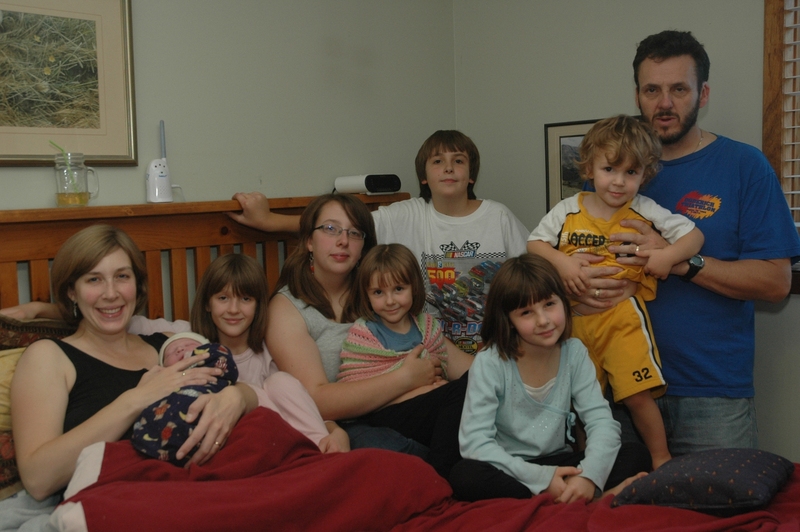 So far, with our first six children, my pattern has been that every single baby has been later than the one before. Baby number six was 11 days past my due date, so I didn’t have really high hopes for this stretch and sweep. I have had them before in some pregnancies and they haven’t worked, so I figured if it did work, I was definitely ready and needing only a little nudge and if not, I wasn’t going to try again. One of the midwives I really like did my stretch and sweep. Hers are described as ‘legendary’. I wasn’t sure about having a legendary one…but we went ahead. She said my cervix was ‘like butter’ and that there really wasn’t a lot for her to do since my body had nearly done it all already. Nevertheless, it was a doozy! Karin is a fantastic midwife. She is someone who really trusts in a woman’s body, who takes a less-medical approach than a lot of midwives nowdays and, yet, who is calm and competent in difficult situations. She also happens to be a lot of fun and a fellow-Christian, which is a wonderful blessing during a birth. From there, we tried to finish up our last errand, which was going to the grocery store. I had several good contractions, which felt suspiciously like actual labour, and we decided it was safer to head home. I asked Karin to make her way over to our house to at least set up her stuff, which is what she asked me to do if I was unsure about whether or not I was in labour. I have had some very precipitous births in the past and we didn’t want a repeat of the last one where the midwives weren’t able to make it in time! I also called my 16yo daughter to ask her to start filling our birth pool. At home, my brother picked up the four middle children to allow us to have a little more quiet for concentrating on our birth. My littlest (baby guy is now 2 1/2 years old!) was napping and my 16yo stayed home to be with him and help us out. I changed into comfy clothes, sat on the exercise ball for awhile and then after Karin arrived, Steve and I went for a short walk in the beautiful sunshine. Contractions were 3 mins apart, but very manageable. Arriving home, I was still contracting every 3 minutes and realized that although I put it on my to-do list everyday for the last 3 weeks, I had never baked our traditional ‘Welcome Baby’ cake. So, between contractions, I got a cake into the oven and Steve set the timer for 33 minutes. I was a little concerned about what the cake would taste like afterwards, since it was a bit difficult to concentrate on what I had and hadn’t put into the cake. (It was great! Phew.) While making the cake, I also called my dear friend, Elisa, who has been with me for 3 births now, to come. 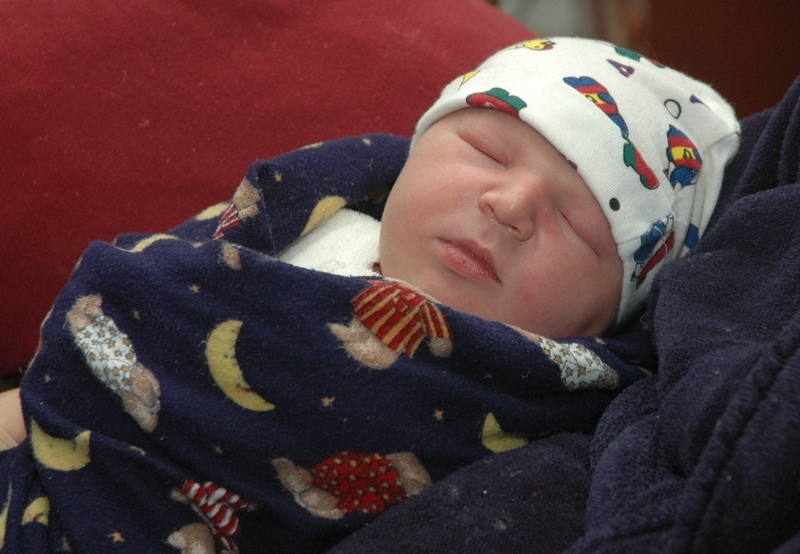 At some point, our second midwife, Martha, also arrived. It was such a joy to have her as the back-up midwife. She is a very experienced midwife who is a true advocate for women and for natural births. When she is around, you just feel powerful and capable. I felt like going up to my bedroom at this point, having manageable contractions, but ones that had me vocalizing and concentrating harder. One thing I was really enjoying about this labour was that once a contraction was done, no matter how intense, I was able to have a complete rest in between. I have had labours where they all seem to come one on top of the other and I end up in a ‘fog’, but this was very refreshing. I find it has a lot to do with when my water breaks. If my water is broken, I can feel a bit more out of control. If not, like this time, it is much easier. (Note: I am not saying it is ‘easy’!) I find I manage with labour very well until transition and then it is really hard, but too late to do much about it! I always try not to say anything negative when in this stage, so people won’t throw it back at me. “You said you’d never do it again!”, etc. This time, I just said whatever I wanted and even let myself cry, which felt kind of good. When the birth pool had enough water in it, I got in. Steve says it was about 4pm. After a few contractions in the water and I asked for someone to call my parents to come with the children from their place 3 minutes away. Karin (7 months pregnant), actually got into the pool to catch the baby. She is one dedicated midwife! Later she told me they had a discussion amongst the midwives as to who and who wouldn’t get into the pool with a client. Karin said the way I was positioned and with her belly, it was her best option. One other midwife said, “Then you get your client to move!” Looking at the pool after a birth, I’m not sure what I’d do if I were a midwife! I was on my hands and knees in the pool, which is my favourite position, since I like to smush my face into the pool during contractions. I didn’t ever really push, as I tried to let the baby come gently on his own. I birthed the head in 1 contraction. My water was still intact and Karin nicked it at this point. The rest of the baby was birthed in the next contraction. (Ahhhhh…instant relief!) “It’s a BOY!! !” shouts Steve and everyone celebrates, though we really knew it instinctually all along. At 4:31pm, Arden Stewart was born at our home, weighing 10lb 4oz and 21 1/2” long. He was born exactly 9 years and 9 minutes after our daughter, who got to celebrate her birthday with the special gift of a new little brother! And…then the cake timer went off. I feel like a very blessed woman to have such a wonderful husband and 7 beautiful children, a precious extended family plus some incredible friends.